40 S&W was developed in 1990, providing the FBI and the rest of the world with a round that had both excellent penetration and great stopping power with less recoil than the FBI's alternate choice, the 10mm Auto. This round is just the all purpose cartridge you need, ideal for self defense, range training, and match shooting. 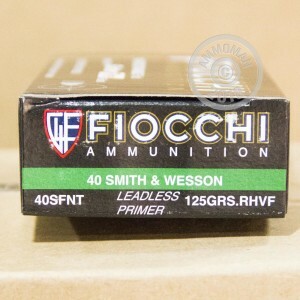 Since 1876, Fiocchi has been producing high quality ammunition. In order to deliver reliable and consistent products, Fiocchi uses only the best components in their ammo, including these SinterFire lead free, frangible projectiles. 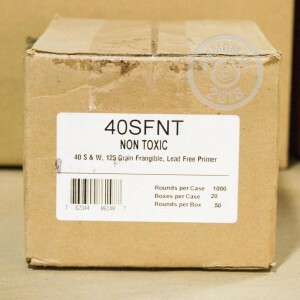 These 125 grain frangible bullets are designed to disintegrate upon impact with a hard surface. 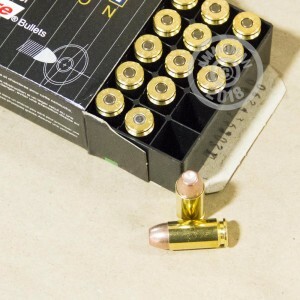 These are perfect rounds for shooting steel targets and can even be used for self defense applications where barrier pass through is a concern. At Ammoman.com all orders over $99 will ship for Free! So stock up and save!